Another selection of horror movies that have a bodycount, a loon, and a barrier that stops them being classed as (by me, at least) as slasher flicks. See the previous lists here and here. Lucky McKee’s sort-of follow up to the film Offspring is a harrowingly brilliant tale of a feral woman captured by a sociopathic family man who tells his oppressed wife (the ever reliable Angela Bettis) and family that the plan is to civilise her. 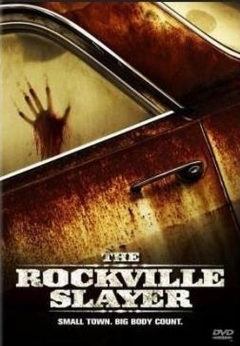 As we learn that the patriarch of the family is a twisted prick who rapes his teenage daughter and doesn’t mind the beginnings of sexually depravity in his son, The Woman, understandably unhappy with being strapped up in a root cellar, is unleashed by said teen daughter to reap a cannibalistically bloody revenge. Why it’s not really a slasher flick There may be a ‘massacre’ of sorts (three victims), but The Woman is anything but a slasher flick. The accent being on the monsters in plain sight rather than a forest-dwelling neo-zombie. But see it regardless, it’s truly awesome. Somebody once posited on a message board that “Alien is a standard slasher”. And there were later reviews that dubbed it “Halloween in space”. 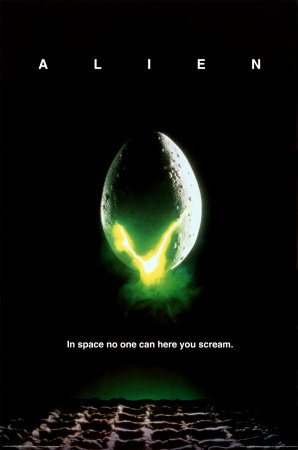 Whichever way you cut it, Alien is an undisputed masterpiece of modern cinema. When I first saw it as a nipper in the 90s, I couldn’t believe it had been made in the 70s. Long and slow but totally worth the wait for the horror to begin but the characterisations are, like The Woman, well beyond the usual kill-fest. Although we all remember Sigourney Weaver for her pioneering role as uber-heroine Ripley, her six co-stars are equally drawn out as validated and believable people. Why it’s not really a slasher flick Put simply, the ‘killer’ here is working on instinct, not motive. Otherwise, Jaws and every other creature feature that have a series of attacks would be classed as slasher films. Although I only watched this movie about three weeks ago, I’ll be damned if I can remember it. 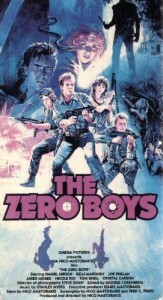 Things definitely began in the usual way with a quartet of parked-up teenagers gettin’ down n’ dirty are attacked by a knife-wielding maniac. Boo-hoo, cries the town. A female detective comes along. Joe Estevez doesn’t go overboard for once. An escaped mental patient who everyone blames for everything. Big-faced Maniac Cop Robert Z’Dar loiters. And the end didn’t make sense but as I hadn’t been paying much attention I can’t really lay the blame at the film’s feet for that. Why it’s not really a slasher flick The first ten minutes are the stuff every post-Friday the 13th movie is made of, but after that it becomes a really, really boring character study with some mystery stirred in and left to simmer. A watched pot never boils and this film never ignites. 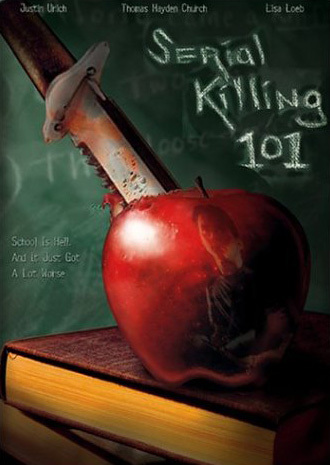 Disenchanted but charismatic high-schooler Justin Urich (curiously also seen in Horror 101) turns in a school report that states he intends to graduate and become a serial killer. Teacher freaks. No one else cares. Except Lisa Loeb. Remember her of 90s international hit Stay (I Missed You)? She agrees to help him prep if he’ll make her his first victim. Meanwhile, a bitchy classmate of theirs is murdered FOR REALZ!!!11!!1! The duo profile the killer, solve it, save the day, fall in love, and Urich decides to be an FBI profiler instead. Why it’s not really a slasher flick There’s only one murder as I recall and, as the title suggests, it’s committed by a serial killer rather than a loon who offs a string of teens all at once. Bear with me, I saw this yeeeeeears ago. A trio of survivalist types and their girlfriends go into the woods for a weekend and disturb a gaggle of looney toon backwoods types. They might’ve been drug-addled. I can’t recall. Nominal heroine Kelli Maroney had Kiefer Sutherland/Lost Boys-esque hair and Nicole Rio from Sorority House Massacre is in it. The third girl had a cast on her leg, which made hobbling away from any advancing maniacs amusing. Why it’s not really a slasher flick Of the main characters, only one of them bites it. I think a few other schmucks bought it earlier on but this was more like the dull parts of The Final Terror mixed with sub-A-Team improvised-trap bravado. See it for the hair. I’ve seen some places call The Terminator (just the first one, though) a “half-slasher”. I can kind of see the logic. Alien and Jaws isn’t a full-blow slasher, per-se, but rather a proto-type. Though, I have to disagree with the notion that every killer has to have a motive to be a full slasher; if slashers are supposed to have motives and not react on animalistic instincts, then we wouldn’t have films like Halloween (at least the first one), Henry: Portrait of a Serial Killer, Humongous, Castle Freak, The Strangers, Hell Night, Cold Prey, etc., who all just kills for the sake of killing and holds no true reason behind their impulses. There are also some examples of creature-feature siding into being slasher flicks; Pumpkinhead has a monster reacting upon the purpose of exactly revenge for a summoner, Wolfen had supernatural wolves killing folks in a big city to protect their turf, The Boogens had a cluster of turtleloids hacking people with their claws, it’s not so much that every creature feature flick would count as slashers, but it’s more like if the film has the slasher structure in the first place. But, like I always say, one man’s Prom Night is another’s , ugh, Prom Night remake; everybody has their definition of what a slasher film is, thus makes his sub-genre so complex and interesting. also, to Lord Crayak, yes, the first Terminator has the slasher feel to it. Indestructible killer stalking a lone victim and killing anyone that gets in the way. It’s half and half, but yes, it has it’s parts. There aren’t many – if any – slasher movies where the killer states “I just like killing”, there’s almost always a circumstance or prompting external force. Michael Myers may be a pseudo exception but then Loomis describes him as a damaged (evil) child. It wasn’t until the latter sequels that we know Cold Prey’s Mountain Man was abused, but you have a point, he may have developed a need for alienation after seeing that he couldn’t count on anyone. I think Final Exam had a random killer that came out of nowhere, literally. Then there’s The Town that Dreaded Sundown, Drive-In Massacre, Slumber Party Massacre, Neon Maniacs, Satan’s Little Helper, Stagefright, The Sleeper, Death Stop Holocaust and If A Tree Falls.